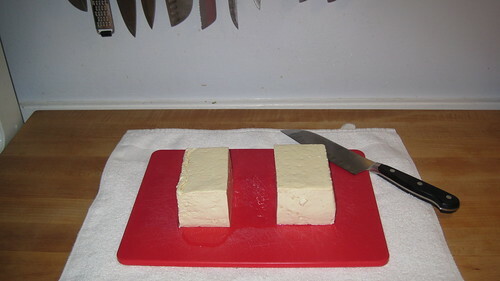 While I was writing a post involving marinated tofu for the blog, I googled “how to press tofu” with the intent of linking to it for the recipe. 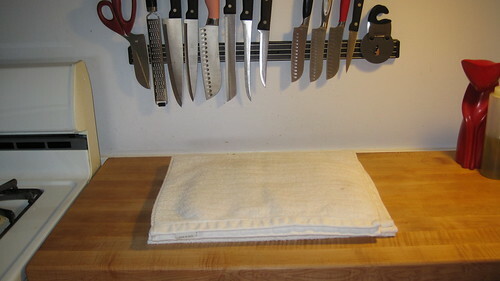 During my search, I came across a TofuXpress, which I own and find useful for transforming the texture and density of tofu, but using this does not produce the same result as incorporating in some kind of absorbent material (towels) to get out virtually all of the moisture. 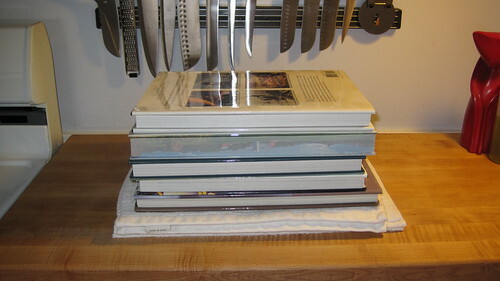 And although many of the links I found involved a weight and towels, I couldn’t find a “how to” that followed my method. So I thought, “Why not make my own?” Now, this isn’t rocket science, but properly pressed tofu is an essential step when marinating, as it maximizes the tofu’s ability to fully absorb the flavor of the marinade. 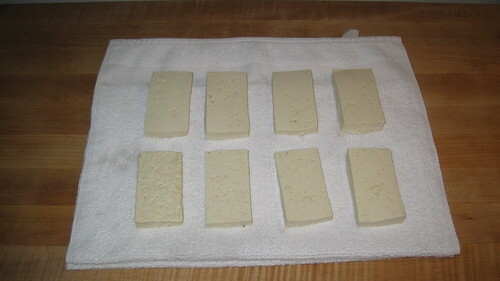 Step Two: Cut your tofu in half, and then the halves into halves and then those halves into halves to make eight equal-sized pieces. This is a perfect how-to, really great! I have the problem of not having so many towels to use and then just throw them in the washing machine, since I don't wash clothes very often. But pressed tofu really is something different from non-pressed so I guess it's worth it in the end. Thanks vegantester! I've heard of the freezing/pressing method before but the baking step is new to me. 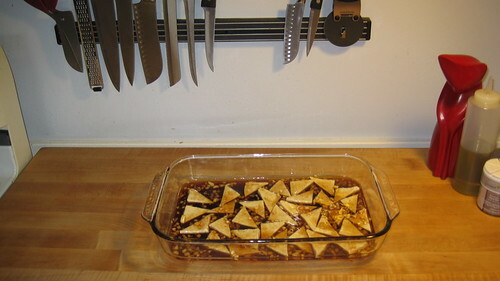 I'm going to try your method the next time I marinate my tofu! an extra tip: the baking time and temp really depends on how 'properly' you want to do it and how dry/chewy you like it. i sometimes over-bake it and it gets a little too dry. one other thing i discovered recently is that the texture is even better when you 'rest' the tofu after cooking – just like meat! Hi Erin. Your photos are incredible, and I can’t wait to try some of your recipes. I just found your site. I also just got a tofu press yesterday, first day of using it. I see that you make no mention of using an actual press. Is there any reason for that? I did find that the “dishes on tofu on plate” idea worked fine, but took longer than the press that allows me to adjust the screws ever so often. I tried a recipe today (scallops, not yours) made of tofu, and found that it was too wet in the middle still. I’ve never read just how “dry” it’s supposed to be, and so I was concerned about mashing it too much. I thought if I screwed it super flat, the middle would bulge out so much as to burst and cause “egg” salad tofu, instead of my block. Does that realistically happen? And is it even possible to get it the correct dryness and texture without cutting it in half? Thanks for your kind words about the site! 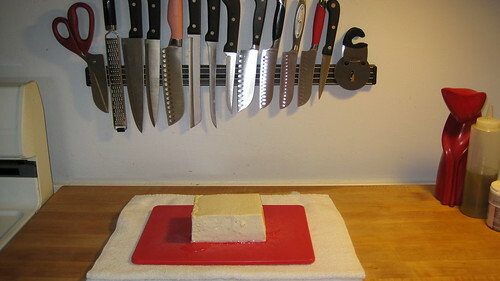 I don’t like using a tofu press for the reasons you list above: it always leaves the tofu wet in the middle. My thought on cutting the tofu into pieces is that is the best way to allow for maximum absorption of marinade and it’s likely going to be cut anyway. Thanks. 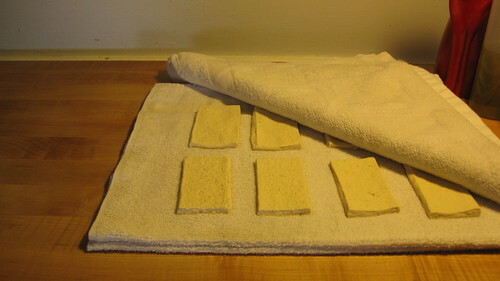 I wrapped my tofu (cut in half, lengthwise) in a microfiber kitchen towel, then put it in the tofu press. Worked great, far better than the press alone, and no lint due to the microfiber. P. S. I *have* now tried many of your recipes, and both I and my (meat-loving) family find them simply wonderful! You’re extremely talented – and creative! Thanks for helping get these two “hard sells” eating more healthfully. The Abundance Diet | Review + Recipe!